I’ve never had so much fun making a present. Maybe it’s because I didn’t have to hide it away and only work on it at night while everyone was sleeping. It took hours and hours to make. Happy hours. Creative hours. Hours spent doing something that is bigger than me or my own family. Every year at church we set up an angel tree to help the families in our neighborhood that need it the most. (You pick a tag off the tree and buy a gift for “Adult Male” or “6 month old girl” or whatever.) In the past Scott and I have always taken a few tags and returned our anonymous gifts. It’s part of what Christmas is all about anyway and we feel strongly about helping people who live right by us. But this year we just couldn’t do it. Instead, I helped make stockings for these angel tree kids. I could at least do that. But one day at church I was sitting there in class, the angel tree set up right in front of me. And I noticed a new little tag. A family had been added at the last minute. And right there in the center was one tag that I couldn’t stop staring at. It said “Girl, age 7. Want: doll”. I stared at it for the entire 45 minute class. I have absolutely zero idea what the teacher was talking about. But my heart was racing, knowing what I was going to do. Then while I very impatiently waited for class to end (I did have the presence of mind to realize that it would be rude to stand up in the middle of the teachers lesson and walk right up to the front of the room…) I had a minor anxiety attack thinking of the possibility that when class was over someone else might get to it first. I KNEW this little tag was for me. As soon as the closing prayer was over, the “Amen” still hanging in the air, I maybe climbed over the empty row of chairs in front of me and snatched the tag as quick as I could. Maybe. But I made it. And that’s all that matters. We didn’t have any money for Christmas, but I have enough craft supplies to circle the planet, twice over. And I knew I could make a beautiful doll without spending any money. But one that this little girl’s parents could never hope of buying. There was only a few days until these gifts were supposed to be returned so they could be delivered. But I talked to the woman in charge and told her I would never make it in four days. But I’d have it done and wrapped and at her house by the 22nd of December. Then I got to work. 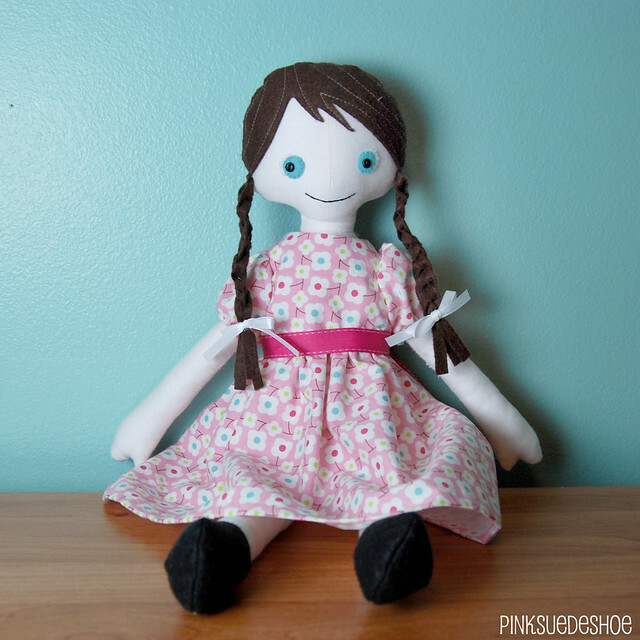 I combined two different patterns to make this doll. 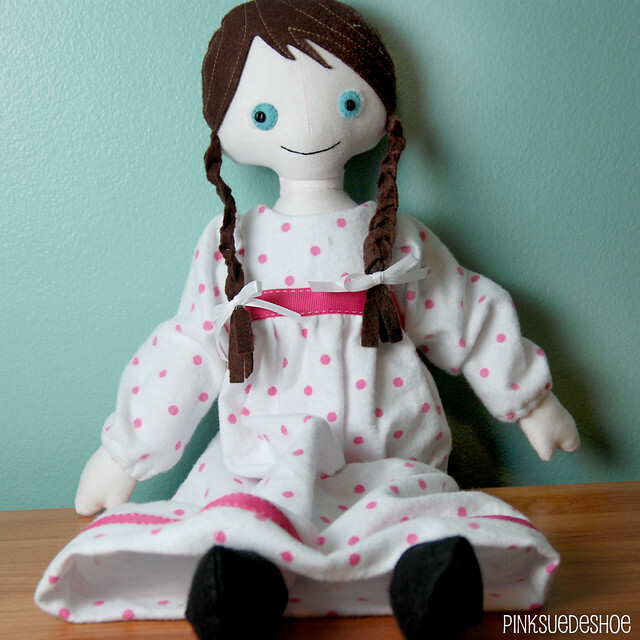 She is part Poppy Doll (from Fiona Dalton at hop.skip.jump) and part Little Red (from Larissa Holland at mmmcrafts). I’d never made either of them before, but after I looked at the pattern pieces I knew I could combine my favorite parts of both to make this Christmas Doll. I did end up buying about 6″ of brown felt for her hair and braids. I just couldn’t make her hair jet black (I saved that for her shoes), or gray. And those were the only options in my stash. After I made my doll I started pulling out fabric scraps for her wardrobe. And then I decided that I was going to go all out. Because little girls need dresses, and shoes, and a school bag. And it was Christmas. She just just wouldn’t have been right without them. Her shoes took a few tries to get right. 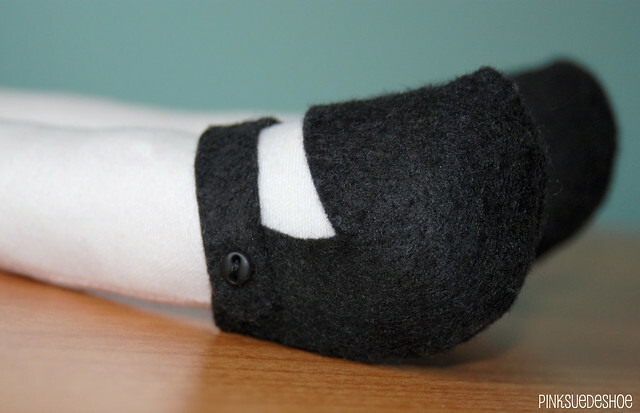 They are black felt with a working button closure. 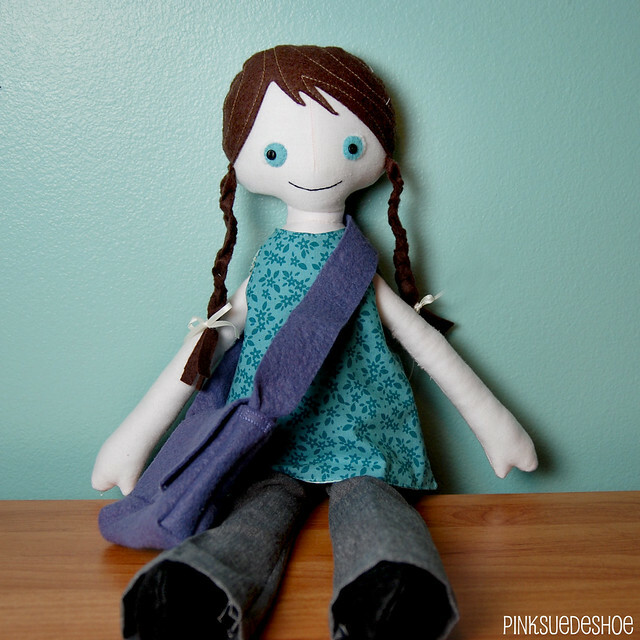 Her school bag is purple felt with a vintage button clasp. As soon as the bag was finished Creamie declared it “so baby cute” and then informed me that she needed keys and a phone and a chapstick and a notebook to go inside. But I thought I should probably make her some pants before I worked on minature chapstick. I tucked an extra set of hair ribbons and a silver heart necklace (a gift from a highschool boyfriends parents. I never even wore it) into her bag instead. I did have to make her pants twice because the first ones just didn’t come on and off easily enough. And the rest of her wardrobe pattern drafting went surprisingly well. I think I had my own little angel watching me, making sure i didn’t screw anything up too much because there just wasn’t the time. This little blue shirt has buttons up the back, and is fully reversible. The other side is a cute tealish blue gingham. I had plans to make her a pair of jeans and another shirt or two. But it just didn’t work out. Because it was December, and I couldn’t very well send a little girl out in a little sleeveless shirt, I drafted a pattern for a wool coat too. The Little Red Riding Hood pattern has a beautiful red wool cape, but I didn’t have any red wool. And a Little Green Riding Hood just isn’t the same. I used the hood as a starting point and in much less time than I anticipated I had this cute green coat with wood buttons ready to go. See, that was the sewing angel watching out for me again. I kind of wish she’d stay around all the time. Of course that wasn’t all, because she also needed some flannel jammies. So I drafted that pattern too. I had the perfect pink polka dot left over from making this blanket and amazingly the perfect color of ribbon trim. A small miracle. And I think adding 1.25 inches of 1/16″ elastic to the bottom of the long sleeves was one of the most frustrating things of the whole doll making procedure. Sheesh! I ended up threading it through with a needle because I didn’t have a saftey pin small enough to do the job. Those 2.5 inches of elastic were enough to drive me to eat up all my chocolate stash. True story. And last of all, with just a few alterations to the jammies pattern I was able to make her a party dress. Because little girls need dresses as much as they need coats and bags and jammies and cutie little shoes. I finished tacking down the lining by hand while in the car on our anniversary lunch date the afternoon of the 22nd, and when I got home I added button holes and the sash. But I made it. Kind of. (I ended up cutting the drop off kind of close. But I was NOT letting her go out the door without getting a few pictures.) Santa was already loading his sleigh when I arrived, box in hand, smile in my heart. It was something I’ll never forget. 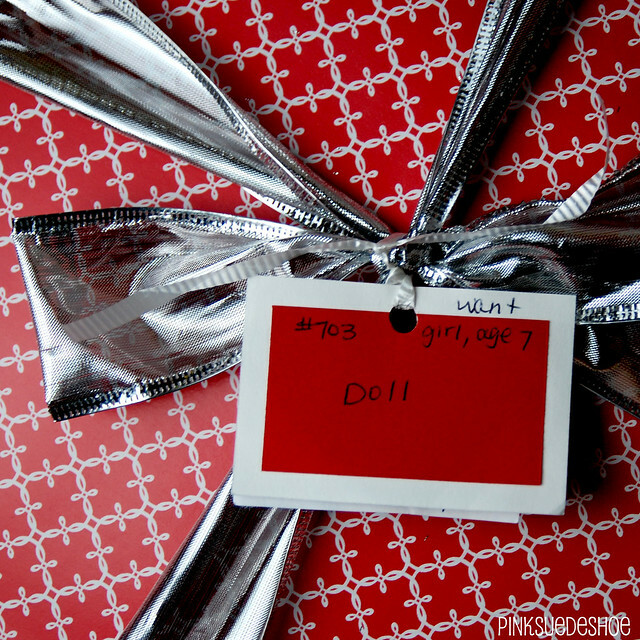 I don’t know which little girl opened her on Christmas morning. But I hope she likes her. I hope she wasn’t wishing for a Barbie, or a Bratz doll or something lame like that. All Christmas morning I kept thinking about my little 7 year old girl, hoping she wouldn’t be disappointed. I will make this doll again. I thankfully made (and kept!) my labeled paper pattern pieces so I won’t have to start over next time. I think next year I’ll make one for Creamie. And a little boy to go with her. (I already have a huge list of clothes I can make. ) While I was working on making this Angel Doll she asked me a few times who it was for. And I told her it was for a little girl who didn’t have any presents for Christmas. She probably didn’t understand, but she accepted the fact that it wasn’t for her. And she was totally OK with that. She gave this Angel Doll a lot of hugs and rockabyes before she was finished, and was happy to help me wrap up all her clothes in tissue paper and put everything in one big box. I can’t wait to do it again next year. I’m all teary eyed. How sweet of you, my youngest is 7 and if she were to receive that doll she would absolutely adore it. I bet that doll has not been put down since it was opened. And all the cute outfits and details and love that you put into it are amazing! This is the most beautiful doll I have ever scene. I love how realistic she looks and that she has the “cool” clothes. I would have loved this doll when I was little…heck…I would love this doll now! You are so talented! That doll is all that and a cute school bag. That green wool coat is so, so cute! I love the jammies, the cute pants, the reversible shirt, the party dress, the pretty brown braids. EVERYTHING! What an amazing Christmas gift for everyone involved. I’ll bet that little girl loved her doll. She is WAY better than Barbie (and that’s saying a lot if you know me). Thanks for sharing your amazing story and pictures. Thank you for sharing your lovely creation and your feelings behind it. My heart just grew two sizes. I know there is an ecstatic 7 year old girl somewhere in Utah. how can any girl old NOT like this doll? great story! You are a legend… As simple as that. What a wonderful thing you did for this little girl. You went ALL OUT too…every time I scrolled to the next picture I thought “of course she needs a…” The doll has such a happy face any little girl would love. Kudos to you for reminding us the REAL meaning of Christmas! A true labor of love. God bless you. Thank you for sharing this. I bet that little girl had such a special Christmas! I’m pretty sure you would qualify for angel status. Big heart angel, inspiration angel, creative genius angel…see? When I made doll baby for lil bit, I had a ball too. I bet that little 7yr. old girl was over the moon on Christmas morning. Even a 7yr. old can see the love in a doll like that. Oh! And I’m so glad you are back on the blogging wagon. You outdid yourself! It’s adorable and so wonderful that you added a wardrobe for her! How can I express how lovely this whole post is? Even the vaulting of the row of desks. I’m just glad my Little Red pattern had a even a small part in blessing this little seven year old girl. It’s close to me because I also have a seven year old girl and can envision her reaction at opening such a treasure trove. Yes, absolutely the more accessories the better. 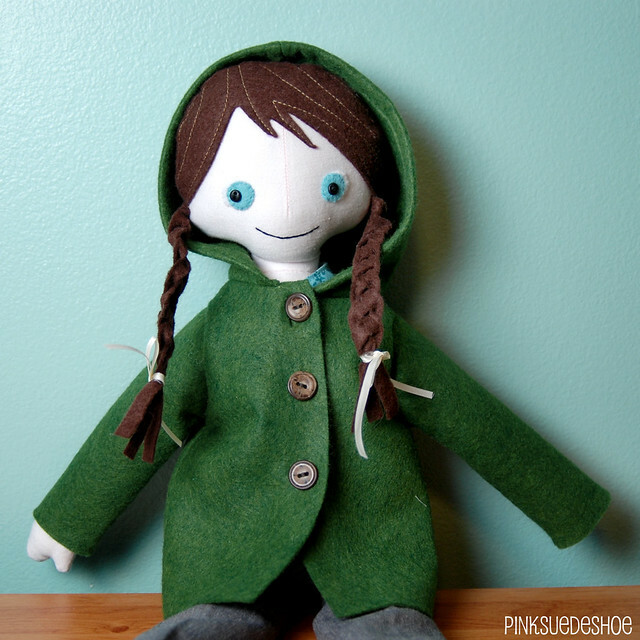 I love all the pretty things you drafted for the doll, but most of all the delightful green wool coat and the button shoes. 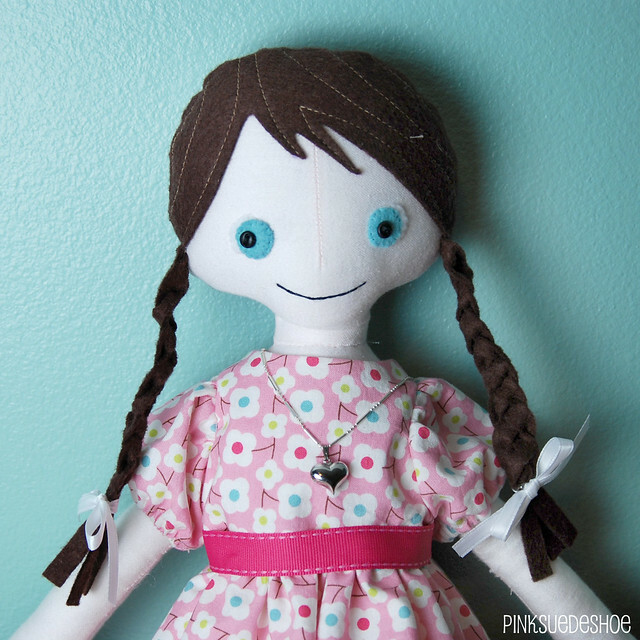 I’ve had my eye on that Poppy doll pattern for a while, what lovely proportions it has. The Christmas Muse was definitely with you for the whole process, and you know I can identify with rush in the blood of the last minute finish. God bless you for your big heart. You are so amazing and inspiring. You’ve just made me–and my fiancé–weep. Thank you for being such an amazing and giving person! I don’t usually comment on blog posts (even though I do check in here all the time and love everything you post! ), but I really just wanted to let you know how heartwarming this is. It just goes to show that there are indeed still so many good people left in the world, and that is a beautiful thought given society today! The doll you made is beautiful and the clothes are so darling. I LOVE the green coat! So cute! Thank you for doing this for that little girl and thank you for being so inspiring and amazing! you’re so talented! And so kind. The clothes are amazing. Just another reason I wish we were in closer proximity friends too. That is the sweetest thing that I have been aware of this holiday season. I have known how talented you are, but on this you really went above and beyond. I love, love, love, that you didn’t do just the minimum. I can see this little girl years from now saying “when I was 7 and we didn’t have $$ for gifts, and all I wanted was a doll, I was given the most amazing doll”. I hope that 2012 will be a wonderful year for you, and that you will be able to craft to your heart’s content. I am so happy that you are back blogging. You inspire me. What a wonderful gift for the lucky recipient and for your heart, too. What a gift! Thank you for giving it to the world! Your gift of talent, prose, kindness. It was a very special thing to do and very inspiring. sooooo sweet. totally your awesome style shows through. LOVE the purse and green coat! great job. What a wonderful story and doll! I love her little outfits and beautiful brown hair! And “they” always say you have to buy a present around here instead of making one. It is so sad….. The doll is wonderful and how much fun for you! I just found out about your blog today from Hannah’s blog. Wow, Erika. Seriously, that is all I have to say (well, not really because I always have a million things to say, but to put my thoughts into one word …) WOW. I have always admired you. You’re just so funny and witty and creative and sincere. I remember the first time I met you you complimented me on my makeup and I thought, “I like her!” And then at some point I remember you bringing a candy bar in your bag for a Relief Society activity and then I knew you really were super duper awesome (I’m a candy fanatic myself). 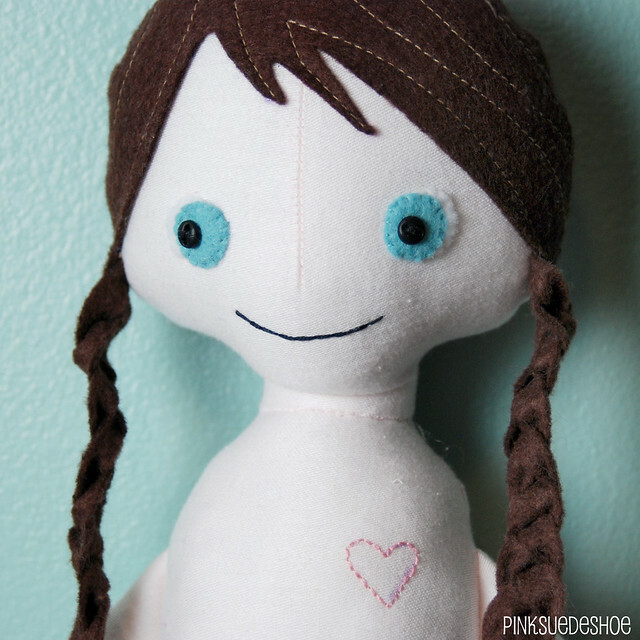 Anyway, what I’m trying to get at is that this post about you making this doll made me cry. And then you had a link about the Christmas tree miracle and I was crying about that too. Thank you for sharing yourself and your talents on this blog. I’ll be back for more posts! Now, back to that doll (because this comment isn’t long enough yet and because I just have to say it loud and clear) I can’t stand it it is SO ridiculously adorable!!! Such a wonderful doll. I love her little stitched heart. This is a more amazing gift than money spent on anything else. No one else in the entire world has a doll like hers. I can imagine it being a priceless heirloom for her. You are so wonderful to share your gift of sewing so freely with others. This story has totally touched me. 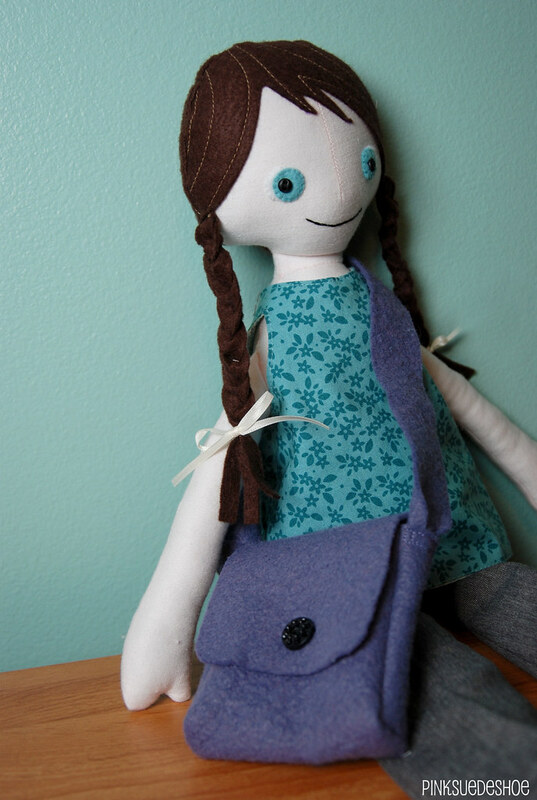 I would very much like to make my own to gift a little girl who does not have much either. Is there any chance you would be willing to share the patterns for clothes that you drafted?? I would be happy to pay for copies. Can you share also what parts you picked from both doll patterns?? Thanks for taking the time to answer this query. hey there and thank you for your info – I have certainly picked up something new from right here. I did however expertise some technical points using this website, since I experienced to reload the web site many times previous to I could get it to load properly. I had been wondering if your web host is OK? Not that I’m complaining, but sluggish loading instances times will sometimes affect your placement in google and can damage your quality score if advertising and marketing with Adwords. Anyway I’m adding this RSS to my e-mail and can look out for much more of your respective intriguing content. Ensure that you update this again very soon..